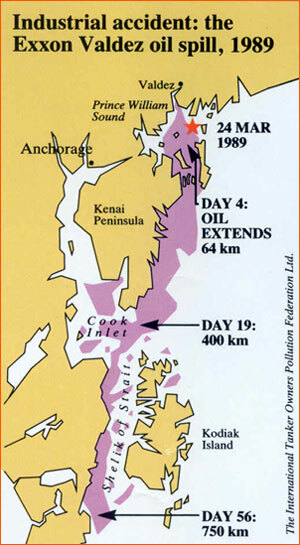 The Exxon Valdez oil spill occurred in Prince William Sound, Alaska, on March 24, 1989. It is considered one of the most devastating human-caused environmental disasters ever to occur at sea. As significant as the Exxon Valdez spill was, it ranks well down on the list of the world's largest oil spills in terms of volume released. However, Prince William Sound's remote location (accessible only by helicopter and boat) made government and industry response efforts difficult and severely taxed existing plans for response. The region was a habitat for salmon, sea otters, seals, and seabirds. The vessel spilled 10.8 million U.S. gallons (about 40 million litres) of Prudhoe Bay crude oil into the sea, and the oil eventually covered 11,000 square miles (28,000 km2) of ocean. No one anticipated any unusual problems as the Exxon Valdez left the Alyeska Pipeline Terminal at 9:12 p.m., Alaska Standard Time, on March 23,1989. The 987foot ship, second newest in Exxon Shipping Company's 20-tanker fleet, was loaded with 53,094,5 10 gallons (1,264,155 barrels) of North Slope crude oil bound for Long Beach, California. Tankers carrying North Slope crude oil had safely transited Prince William Sound more than 8,700 times in the 12 years since oil began flowing through the trans-Alaska pipeline, with no major disasters and few serious incidents. This experience gave little reason to suspect impending disaster. Yet less than three hours later, the Exxon Valdez grounded at Bligh Reef, rupturing eight of its 11 cargo tanks and spewing some 10.8 million gallons of crude oil into Prince William Sound. 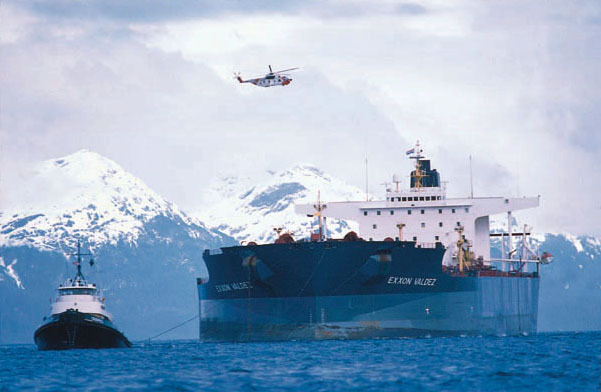 Shortly after leaving the Port of Valdez, the Exxon Valdez ran aground on Bligh Reef. This picture was taken 3 days after the vessel grounded, just before a storm arrived. Until the Exxon Valdez piled onto Bligh Reef, the system designed to carry 2 million barrels of North Slope oil to West Coast and Gulf Coast markets daily had worked perhaps too well. At least partly because of the success of the Valdez tanker trade, a general complacency had come to permeate the operation and oversight of the entire system. 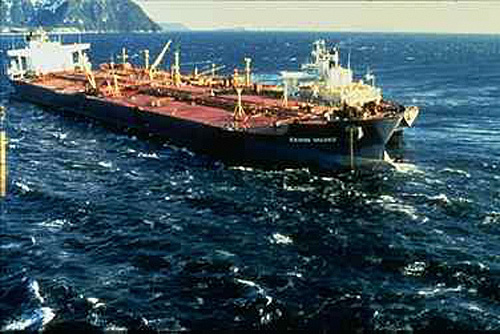 That complacency and success were shattered when the Exxon Valdez ran hard aground shortly after midnight on March 24. No human lives were lost as a direct result of the disaster, though four deaths were associated with the cleanup effort. Indirectly, however, the human and natural losses were immense-to fisheries, subsistence livelihoods, tourism, wildlife. The most important loss for many who will never visit Prince William Sound was the aesthetic sense that something sacred in the relatively unspoiled land and waters of Alaska had been defiled. Industry's insistence on regulating the Valdez tanker trade its own way, and government's incremental accession to industry pressure, had produced a disastrous failure of the system. The people of Alaska's Southcentral coast-not to mention Exxon and the Alyeska Pipeline Service Company-would come to pay a heavy price. The American people, increasingly anxious over environmental degradation and devoted to their image of Alaska's wilderness, reacted with anger. A spill that ranked 34th on a list of the world's largest oil spills in the past 25 years came to be seen as the nation's biggest environmental disaster since Three Mile Island. 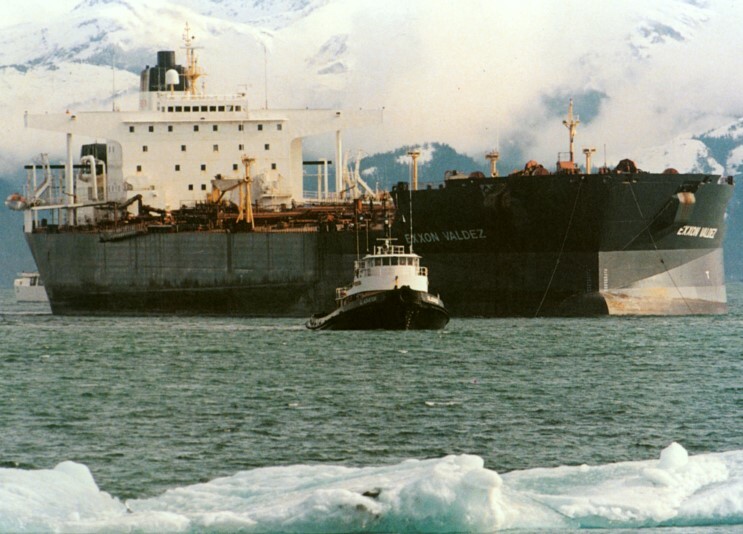 The Exxon Valdez had reached the Alyeska Marine Terminal at 11:30 p.m. on March 22 to take on cargo. It carried a crew of 19 plus the captain. Third Mate Gregory Cousins, who became a central figure in the grounding, was relieved of watch duty at 11:50 p.m. Ship and terminal crews began loading crude oil onto the tanker at 5:05 a.m. on March 23 and increased loading to its full rate of 100,000 barrels an hour by 5:30 a.m. Chief Mate James R. Kunkel supervised the loading. March 23, 1989 was a rest day of sorts for some members of the Exxon Valdez crew. Capt. Joseph Hazelwood, chief engineer Jerry Glowacki and radio officer Joel Roberson left the Exxon Valdez about 11:00 a.m., driven from the Alyeska terminal into the town of Valdez by marine pilot William Murphy, who had piloted the Exxon Valdez into port the previous night and would take it back out through Valdez Narrows on its fateful trip to Bligh Reef. When the three ship's officers left the terminal that day, they expected the Exxon Valdez's sailing time to be 10 p.m. that evening. The posted sailing time was changed, however, during the day, and when the party arrived back at the ship at 8:24 p.m., they learned the sailing time had been fixed at 9 p.m.
Hazelwood spent most of the day conducting ship's business, shopping and, according to testimony before the National Transportation Safety Board (NTSB), drinking alcoholic beverages with the other ship's officers in at least two Valdez bars. Testimony indicated Hazelwood drank nonalcoholic beverages that day at lunch, a number of alcoholic drinks late that afternoon while relaxing in a Valdez bar, and at least one more drink at a bar while the party waited for pizza to take with them back to the ship. Loading of the Exxon Valdez had been completed for an hour by the time the group returned to the ship. They left Valdez by taxi cab at about 7:30 p.m., got through Alyeska terminal gate security at 8:24 p.m. and boarded ship. Radio officer Roberson, who commenced prevoyage tests and checks in the radio room soon after arriving at the ship, later said no one in the group going ashore had expected the ship to be ready to leave as soon as they returned. later indicated that he did detect the odor of alcohol on Hazelwood's breath. Hazelwood's activities in town that day and on the ship that night would become a key focus of accident inquiries, the cause of a state criminal prosecution, and the basis of widespread media sensation. Without intending to minimize the impact of Hazelwood's actions, however, one basic conclusion of this report is that the grounding at Bligh Reef represents much more than the error of a possibly drunken skipper: It was the result of the gradual degradation of oversight and safety practices that had been intended, 12 years before, to safeguard and backstop the inevitable mistakes of human beings. Third Mate Cousins performed required tests of navigational, mechanical and safety gear at 7:48 p.m., and all systems were found to be in working order. The Exxon Valdez slipped its last mooring line at 9:12 p.m. and, with the assistance of two tugboats, began maneuvering away from the berth. The tanker's deck log shows it was clear of the dock at 9:21 p.m. The ship was under the direction of pilot Murphy and accompanied by a single tug for the passage through Valdez Narrows, the constricted harbor entrance about 7 miles from the berth. According to Murphy, Hazelwood left the bridge at 9:35 p.m. and did not return until about 11:10 p.m., even though Exxon company policy requires two ship's officers on the bridge during transit of Valdez Narrows. The passage through Valdez Narrows proceeded uneventfully. At 10:49 p.m. the ship reported to the Valdez Vessel Traffic Center that it had passed out of the narrows and was increasing speed. At 11:05 p.m. Murphy asked that Hazelwood be called to the bridge in anticipation of his disembarking from the ship, and at 11: 10 p.m. Hazelwood returned. Murphy disembarked at 11:24 p.m., with assistance from Third Mate Cousins. While Cousins was helping Murphy and then helping stow the pilot ladder, Hazelwood was the only officer on the bridge and there was no lookout even though one was required, according to an NTSB report. At 11:25 p.m. Hazelwood informed the Vessel Traffic Center that the pilot had departed and that he was increasing speed to sea speed. He also reported that "judging, ah, by our radar, we'll probably divert from the TSS [traffic separation scheme] and end up in the inbound lane if there is no conflicting traffic." The traffic center indicated concurrence, stating there was no reported traffic in the inbound lane. The traffic separation scheme is designed to do just that-separate incoming and outgoing tankers in Prince William Sound and keep them in clear, deep waters during their transit. It consists of inbound and outbound lanes, with a half-mile-wide separation zone between them. Small icebergs from nearby Columbia Glacier occasionally enter the traffic lanes. Captains had the choice of slowing down to push through them safely or deviating from their lanes if traffic permitted. Hazelwood's report, and the Valdez traffic center's concurrence, meant the ship would change course to leave the western, outbound lane, cross the separation zone and, if necessary, enter the eastern, inbound lane to avoid floating ice. At no time did the Exxon Valdez report or seek permission to depart farther east from the inbound traffic lane; but that is exactly what it did. At 11:30 p.m. Hazelwood informed the Valdez traffic center that he was turning the ship toward the east on a heading of 200 degrees and reducing speed to "wind my way through the ice" (engine logs, however, show the vessel's speed continued to increase). At 11: 39 Cousins plotted a fix that showed the ship in the middle of the traffic separation scheme. Hazelwood ordered a further course change to a heading of 180 degrees (due south) and, according to the helmsman, directed that the ship be placed on autopilot. The second course change was not reported to the Valdez traffic center. For a total of 19 or 20 minutes the ship sailed south-through the inbound traffic lane, then across its easterly boundary and on toward its peril at Bligh Reef. Traveling at approximately 12 knots, the Exxon Valdez crossed the traffic lanes' easterly boundary at 11:47 p.m.
At 11:52 p.m. the command was given to place the ship's engine on "load program up"-a computer program that, over a span of 43 minutes, would increase engine speed from 55 RPM to sea speed full ahead at 78.7 RPM. After conferring with Cousins about where and how to return the ship to its designated traffic lane, Hazelwood left the bridge. The time, according to NTSB testimony, was approximately 11:53 p.m.
Cousins was the only officer on the bridge-a situation that violated company policy and perhaps contributed to the accident. A second officer on the bridge might have been more alert to the danger in the ship's position, the failure of its efforts to turn, the autopilot steering status, and the threat of ice in the tanker lane. Cousins' duty hours and rest periods became an issue in subsequent investigations. Exxon Shipping Company has said the third mate slept between I a.m. and 7:20 a.m. the morning of March 23 and again between 1: 30 p.m. and 5 p.m., for a total of nearly 10 hours sleep in the 24 hours preceding the accident. But testimony before the NTSB suggests that Cousins "pounded the deck" that afternoon, that he did paperwork in his cabin, and that he ate dinner starting at 4:30 p.m. before relieving the chief mate at 5 p.m. An NTSB report shows that Cousins' customary in-port watches were scheduled from 5:50 a.m. to 11:50 a.m. and again from 5:50 p.m. to 11:50 p.m. Testimony before the NTSB suggests that Cousins may have been awake and generally at work for up to 18 hours preceding the accident. Appendix F of this report documents a direct link between fatigue and human performance error generally and notes that 80 percent or more of marine accidents are attributable to human error. Appendix F also discusses the impact of environmental factors such as long work hours, poor work conditions (such as toxic fumes), monotony and sleep deprivation. "This can create a scenario where a pilot and/or crew members may become the 'accident waiting to happen.' ... It is conceivable," the report continues, "that excessive work hours (sleep deprivation) contributed to an overall impact of fatigue, which in turn contributed to the Exxon Valdez grounding." Manning policies also may have affected crew fatigue. Whereas tankers in the 1950s carried a crew of 40 to 42 to manage about 6.3 million gallons of oil, according to Arthur McKenzie of the Tanker Advisory Center in New York, the Exxon Valdez carried a crew of 19 to transport 53 million gallons of oil. Minimum vessel manning limits are set by the U.S. Coast Guard, but without any agencywide standard for policy. The Coast Guard has certified Exxon tankers for a minimum of 15 persons (14 if the radio officer is not required). Frank Iarossi, president of Exxon Shipping Company, has stated that his company's policy is to reduce its standard crew complement to 16 on fully automated, diesel-powered vessels by 1990. "While Exxon has defended their actions as an economic decision," the manning report says, "criticism has been leveled against them for manipulating overtime records to better justify reduced manning levels." Whatever the NTSB or the courts may finally determine concerning Cousins' work hours that day, manning limits and crew fatigue have received considerable attention as contributing factors to the accident. 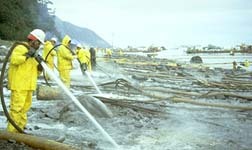 The Alaska Oil Spill Commission recommends that crew levels be set high enough not only to permit safe operations during ordinary conditions-which, in the Gulf of Alaska, can be highly demanding-but also to provide enough crew backups and rest periods that crisis situations can be confronted by a fresh, well-supported crew. Some time during the critical period before the grounding during the first few minutes of Good Friday, March 24, Cousins plotted a fix indicating it was time to turn the vessel back toward the traffic lanes. About the same time, lookout Maureen Jones reported that Bligh Reef light appeared broad off the starboard bow-i.e., off the bow at an angle of about 45 degrees. The light should have been seen off the port side (the left side of a ship, facing forward); its position off the starboard side indicated great peril for a supertanker that was out of its lanes and accelerating through close waters. Cousins gave right rudder commands to cause the desired course change and took the ship off autopilot. He also phoned Hazelwood in his cabin to inform him the ship was turning back toward the traffic lanes and that, in the process, it would be getting into ice. When the vessel did not turn swiftly enough, Cousins ordered further right rudder with increasing urgency. Finally, realizing the ship was in serious trouble, Cousins phoned Hazelwood again to report the danger-and at the end of the conversation, felt an initial shock to the vessel. The grounding, described by helmsman Robert Kagan as "a bumpy ride" and by Cousins as six "very sharp jolts," occurred at 12:04 a.m. The vessel came to rest facing roughly southwest, perched across its middle on a pinnacle of Bligh Reef Eight of 11 cargo tanks were punctured. 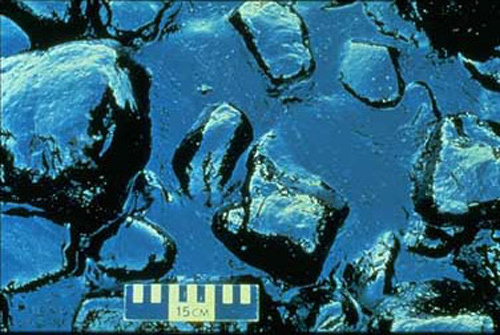 Computations aboard the Exxon Valdez showed that 5.8 million gallons had gushed out of the tanker in the first three and a quarter hours. Weather conditions at the site were, reported to be 33 degrees F, slight drizzle rain/snow mixed, north winds at 10 knots and visibility 10 miles at the time of the grounding. The Exxon Valdez nightmare had begun. Hazelwood-perhaps drunk, certainly facing a position of great difficulty and confusion-would struggle vainly to power the ship off its perch on Bligh Reef. The response capabilities of Alyeska Pipeline Service Company to deal with the spreading sea of oil would be tested and found to be both unexpectedly slow and woefully inadequate. The worldwide capabilities of Exxon Corp. would mobilize huge quantities of equipment and personnel to respond to the spill-but not in the crucial first few hours and days when containment and cleanup efforts are at a premium. The U.S. Coast Guard would demonstrate its prowess at ship salvage, protecting crews and lightering operations, but prove utterly incapable of oil spill containment and response. State and federal agencies would show differing levels of preparedness and command capability. And the waters of Prince William Sound-and eventually more than 1,000 miles of beach in Southcentral Alaska-would be fouled by 10.8 million gallons of crude oil. After feeling the grounding Hazelwood rushed to the bridge, arriving as the ship came to rest. He immediately gave a series of rudder orders in an attempt to free the vessel, and power to the ship's engine remained in the "load program up" condition for about 15 minutes after impact. Chief Mate Kunkel went to the engine control room and determined that eight cargo tanks and two ballast tanks had been ruptured; he concluded the cargo tanks had lost an average of 10 feet of cargo, with approximately 67 feet of cargo remaining in each. He informed Hazelwood of his initial damage assessment and was instructed to perform stability and stress analysis. At 12:19 a.m. Hazelwood ordered that the vessel's engine be reduced to idle speed. At 12:26 a.m., Hazelwood radioed the Valdez traffic center and reported his predicament to Bruce Blandford, a civilian employee of the Coast Guard who was on duty. "We've fetched up, ah, hard aground, north of Goose Island, off Bligh Reef and, ah, evidently leaking some oil and we're gonna be here for a while and, ah, if you want, ah, so you're notified." That report triggered a nightlong cascade of phone calls reaching from Valdez to Anchorage to Houston and eventually around the world as the magnitude of the spill became known and Alyeska and Exxon searched for cleanup machinery and materials. Hazelwood, meanwhile, was not finished with efforts to power the Exxon Valdez off the reef. At approximately 12:30 a.m., Chief Mate Kunkel used a computer program to determine that though stress on the vessel exceeded acceptable limits, the ship still had required stability. He went to the bridge to advise Hazelwood that the vessel should not go to sea or leave the area. The skipper directed him to return to the control room to continue assessing the damage and to determine available options. At 12:35 p.m., Hazelwood ordered the engine back on-and eventually to "full ahead"-- and began another series of rudder commands in an effort to free the vessel. After running his computer program again another way, Kunkel concluded that the ship did not have acceptable stability without being supported by the reef. The chief mate relayed his new analysis to the captain at I a.m. and again recommended that the ship not leave the area. Nonetheless, Hazelwood kept the engine running until 1:41 a.m., when he finally abandoned efforts to get the vessel off the reef. The captain was seen in a local bar, admitted to having some alcoholic drinks, and a blood test showed alcohol in his blood even several hours after the accident. The captain has always insisted that he was not impaired by alcohol. The state charged him with operating a vessel while under the influence of alcohol. A jury in Alaska, however, found him NOT GUILTY of that charge. The jury did find him guilty of negligent discharge of oil, a misdemeanor. Hazelwood was fined $50,000 and sentenced to 1,000 hours of community service in Alaska (State of Alaska v. Hazelwood. He completed the community service ahead of schedule in 2001. He picked up trash along the Seward Highway and worked at Bean’s Café, a "soup kitchen" for the homeless in Anchorage, Alaska. Approximately 11 million gallons or 257,000 barrels or 38,800 metric tonnes. Picture the swimming pool at your school or in your community. The amount of spilled oil is roughly equivalent to 125 olympic-sized swimming pools. 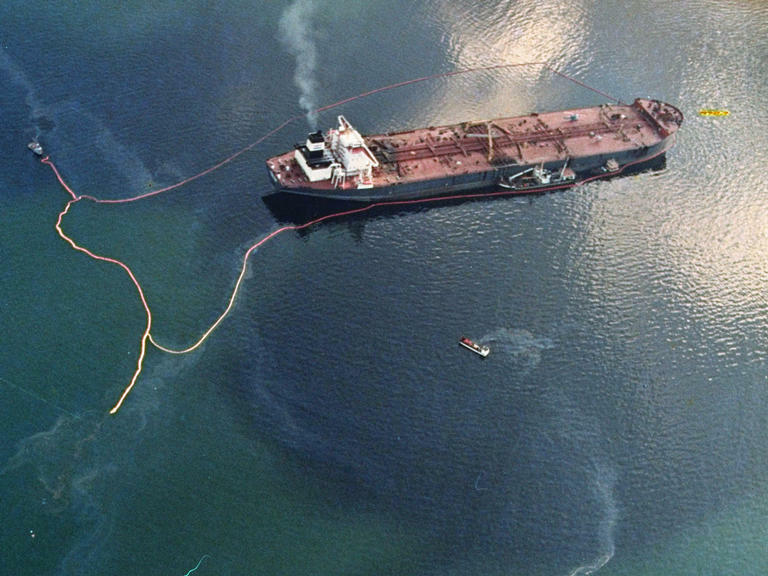 The Exxon Valdez spill, though still one of the largest ever in the United States. 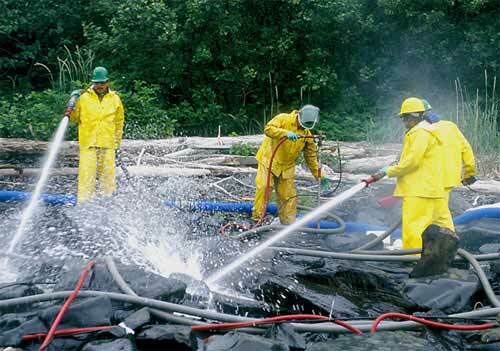 It is widely considered the number one spill worldwide in terms of damage to the environment, however. The timing of the spill, the remote and spectacular location, the thousands of miles of rugged and wild shoreline, and the abundance of wildlife in the region combined to make it an environmental disaster well beyond the scope of other spills. TIP: Check out National Geographic , January 1990, Pages 18-19 for a great illustration on how shoreline cleanup was conducted. Lingering injuries continue to plague some injured species while others are fully recovered. TIP: Check out National Geographic , January 1990, Page 26-27 for a great illustration on how oil affects the fur and feathers of wildlife. A professional team and dozens of volunteers, including veterinarians, set up a cleaning facility and recovery facility. Dawn dishwashing detergent was the cleaning agent of choice.